1980 – Rappers Delight Becomes the First Hip Hop Song to Appear in the Top 40. The song, while not the first rap song, was the first huge hit in the nascent genre. It was performed by a group called the Sugar Hill Gang. The group was lined up by Sylvia Robinson who had heard young people rapping and wanted to record them, but she was having a hard time finding anyone willing to record. Her oldest son Joey knew Henry Jackson (Big Bank Hank) and recruited him for the project and Michael Anthony Wright (Wonder Mike) and Guy O’Brian (Master Gee) followed and the story is that they met her on Friday and recorded the song on Monday in one 15 minute take. The story is not without controversy however. The main groove on the song was “sampled” from Chic’s disco song “Good Times.” Niles Rodgers, who wrote good time was in a dance club and heard his song being played with rap lyrics over top of it. When he found out it had been put out in an album, he and Bernard Edwards took legal action and thereafter received co-writing credits and proceeds from the sale of Rappers Delights. 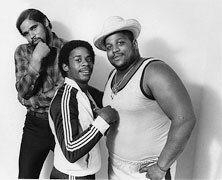 As well, Big Bank Hank helped to manage a rapper named named Grandmaster Caz of the Cold Crush Brothers and asked Caz for some lyrics to use. Caz gave him a book of his rhymes and Herc used some of them almost verbatim on he song, even spelling out Casanova’s name. Caz, nonetheless, did not receive any writing credits or financial compensation. Beyond the financial aspects, many in the hip-hop industry were very angry that three guys who barely knew each other were launched into stardom when other in the community with serious credibility had been crafting the genre for years. Beyond the controversy, the record was a huge hit, selling over two million copies, hitting #36 on the U.S. pop charts, #4 on the U.S. R&B charts and being named #248 on Rolling Stones list of the 500 Greatest Songs of all-time.